Waiting too long is risky! Organizations that have not yet made a significant move towards a more collaborative way of working are running a number of risks. Information is increasingly scattered over different platforms and tools as people build their own solutions. The essential distinction between managed, validated information and “work in progress” gets blurred unless there are some fundamental governance guidelines in place. Business and customer actions may be taken (or not) on the basis out-of-date or incomplete information. People need specific capabilities in order to collaborate with each other. Recent data shows adoption of social collaborative capabilities is far from widespread, there is still resistance and fear in most organizations and it often comes from management. (Data included in the article). In this article I look at two real cases and share three fundamental principles for implementing social collaboration to alleviate business risks. The two cases are radically different, the two organizations have very different cultures and priorities, but the principles (inspired by John Paul Kotter‘s work) are the same. One: Build urgency statements and relate them to business risks. Two: Empower people to act. Three: Blend short and mid-term actions through quick wins and process improvement. In a nutshell, people need a reason to change, the power to act, and visible results from their actions. Social collaboration comes down to basic capabilities. So why is it so hard for organizations to get it? Based on data from my latest Digital Workplace Trends survey, very few organizations have reached enterprise-wide levels of adoption. 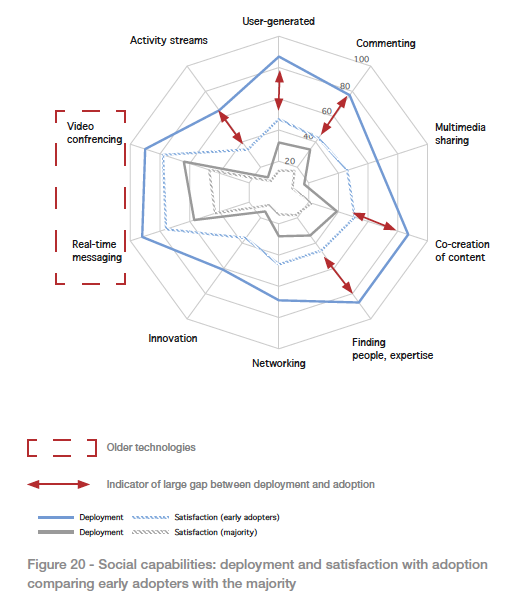 Even the early adopters with broad deployment of social collaborative capabilities have low levels of adoption. 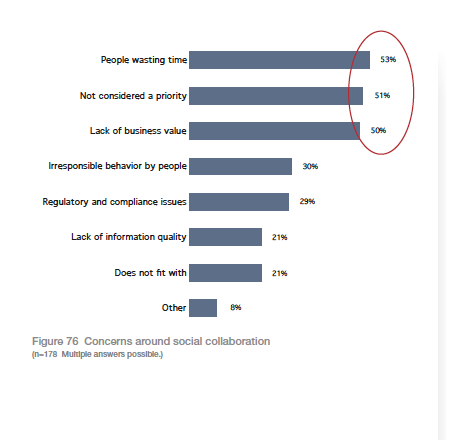 Is social collaboration a waste of time? Does it bring no business value? These are the top two concerns expressed by people. Or is social collaboration being blocked by management? Early adopters say middle managers offer the most resistance. The majority of organizations, those that are less advanced in social initiatives, say top management is blocking. It’s risky to wait too long. Why? I know two real, very different cases where the need for social collaboration has become urgent for the organization. I’m working with an organization whose “product” is highly specialized advice and consulting in a sensitive and strategic domain. Many of the people are researchers and experts. 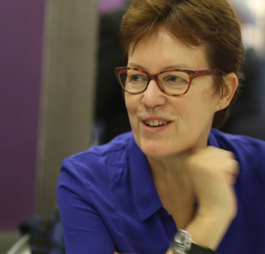 A senior expert has from 25 to 30 years of experience and is now nearing retirement age. In 2 or 3 years, around one third of the experts will retire. The intranet contains a lot of content but is structured in silos making it hard to find information and people outside a person’s immediate environment. New employees are building new wiki-based sites that they find easier to maintain collectively. This consensus-driven organization has a strong culture of trust, works primarily in face-to-face workshop mode, and has a long multi-step validation process for documents because of the critical nature of the content. Most consumer-similar tools (Skype-like, Twitter-like) are forbidden but people sometimes use them internally anyway because the need to do something is greater than the need to follow policy. Another organization I work with has an intranet that is 7 or 8 years old, on old technology that’s hard to use. They have a thriving social network. People who use it love it, so much so that they are beginning to store documents on it rather than in the document libraries or intranet. But not everyone uses the social network. Individual people in different parts of the organization have built alternative solutions mainly by using wiki technologies. In the meantime, reference documents are stored in different platforms and hard to find if you don’t know where to look. An entrepreneurial culture has long existed in this organization as it has a strong engineer-driven, build-it-yourself attitude. So how do we build a sense of urgency? Any major change needs to be propelled by a sense of urgency. Urgent does not mean fast. It means important. It means “We need to act now.” For John-Paul Kotter, former professor at the Harvard Business School and world-renowned authority on leadership and change, establishing a sense of urgency is the first step in making lasting change. How does urgency lead to lasting change? However it’s not enough to build urgency. The compelling emotion of urgency must be sustained over time. Change does not happen over night. One: Urgency statements are more compelling if they are related to business risks. This ensures that management will hear the message and that it may even be possible to do some measurement. Two: People must be empowered to act. Depending on the organizational culture, empowerment derives from top-down mandated programs or bottom-up validated initiatives. If both exist in the same organization, that’s ideal, but usually one or the other starts the ball rolling. Three: Short-term quick wins and mid-term process improvements are both essential to success. The quick wins keep up the momentum and improved processes embed change in daily work. Let’s look at our two cases again and step through the three phases for each: (1) building urgency, (2) empowering people and (3) combining quick wins with process change. Relate urgency to business risks. “We are running the risk of making business errors and incurring financial and reputational liability. This is because of two issues. Our information is so fragmented that people sometimes use ‘work in progress’ information thinking it is final policy. Senior management are responding to the urgency. Their biggest challenge is time. Three parallel actions have been identified in order to lighten the analysis phase and make change happen faster. The internal digital team has been mandated to carry out the actions. The entrepreneurial spirit has kicked in and an operational team has self-organized. Their biggest challenge is to bring a necessary minimum of governance to a culture that has long been operating with few constraints. Their initiative has been validated by their line managers who have in turn gotten sponsorship from a top manager. Work from quick wins to better processes. Case 1 – Start with the obvious, then delve into process analysis and improvements. (Quick). Immediately implement key new capabilities that they know everyone needs. Examples: real-time messaging and support for BYOD (bring your own device). (Quick). Identify what exists in the organization and, where relevant, extend the local solution to a global scope. (Process). Conduct a needs analysis based on creating personas and see how they interact on the major processes of the organization. See if social collaborative capabilities can help simplify and accelerate how information and knowledge are shared. Case 2 – Clean up and clarify, then build a light digital workplace governance framework. (Quick). Define and implement automated scripts to clean up (removing documents from the social network, putting intranet pages not accessed recently into a temporary archive, etc.). (Quick). Identify a “human” governance framework. Formalize an operational digital board with two types of members: “platform owners” and “business owners”. Get sponsorship from two top senior directors. (Process). The organization has decided not to build a digital workplace on a single platform. Instead, their plan is to define and communicate simple guidelines clarifying which platforms should be used for which needs. The guidelines are high level along the lines of: “You want to get feedback on an idea …. Do it on the social network. You want to develop a document with your team…. Do it in a collaborative space. You want to publish a new policy…. Do it on the intranet.” The purpose is to optimize each platform’s strong points, make content and information more findable, and still leave people free to decide how they organize their collaborative spaces and communities. People need a reason to change, the power to act, and visible results from their actions. One: Relate urgency statements to business risks. Two: Empower people either by top-down mandate or validation of bottom-up initiatives. Change depends on people. Don’t forget that deployment is not adoption, and adoption is best triggered by a sense of urgency. Otherwise, why change! ?